Okay, I did that on purpose. I can eat on plan at noon after a morning of homeschooling, laundry, and dinner prep, if all that’s required of me is grabbing a handful of this, that, and the other. Having a variety of S and E selections on hand ensures I don’t eat the same fuel type all the time. Here are some Prepackaged Pam type things (meaning, I can take them out of a wrapper or container, no cooking required) I prepare and how I divide them so I can enjoy a Trim Healthy Mama-friendly lunch platter 3 different ways, all week long. Note: I should really have another carb source to make this a good E meal, like a serving of fruit. I would have added an apple to the plate, but I’m plum outta groceries! You’ll notice that some of the foods on each platter are the same. Cucumbers, strawberries, pickles, salsa, lean chicken breast, 0% fat cottage cheese, 0% fat Greek yogurt, and peppers are all Fuel Pull foods, meaning, there aren’t enough fat or carbs in them to make them either an S (fat) or an E (carb), so they work in both settings. Each platter also has at least 3 good sources of protein. Guacamole is a definite S because avocados are high in good fats. Eating Guacamole in an E meal would put you into Crossover mode. Baked corn chips are an E because they are carb-based and have almost no fat. You could have a few in an S setting (up to 6-10 grams of net carbs), but any more than that would also put you into Crossover mode. Do you like finger foods for lunch? I love the variety a platter offers. I’d love to hear your favorite grab ‘n go style S & E selections! I am a visual person, and this is SO helpful! Thank you! It looks like a lot of food! Hi Amy, I actually prepare much more food than is shown here and just take what I need from the platter at lunch time. I would probably consume everything on the E platter in one sitting, but the S platter has too much meat and cheese. I would be stuffed without about half that amount! This is awesome. I love finger food snacks. Thank you this was so helpful. I’ve been struggling to grasp this and constantly make mistakes. I’m very visual as well, so this is VERY helpful!!! I am new here, so maybe you’ve done this, but I would like to see pictures of a whole meal. 🙂 It helps me “picture” what do pair together! Thanks! I too am a visual person and this is very helpful! Thank you! I have e platters for lunch quite a bit. It is usually two wassa cracker with either peanut butter junkie and slim belly jelly (THM cookbook) or laughing cows and Slim BJ, two pieces of fruit, a dried fig or two, and some beet chips. Sometimes some 2% cottage cheese. Hey Jacinda can you tell me what kind of sausage that you use on your platter? I am new to THM and trying to make sure I always get the right products! Still trying to balance all my meals! Hi Amiee, it’s a sugar-free pork sausage from President’s Choice (Canadian brand). I found it in the deli section at Zehrs! Any sugar-free, corn or wheat -free sausage is on plan in an S setting. This is great! Thanks! Like that you showed the overall pictures and then the pictures with just the proteins. Are there other meats that are go to options for a finger plate other than chicken and sausage? Hey Amanda, lean turkey breast and tuna packed in water are other E options. This is so helpful. I get overwhelmed so easily so when I search “easy” this is what I’m talking about! Thank you!! 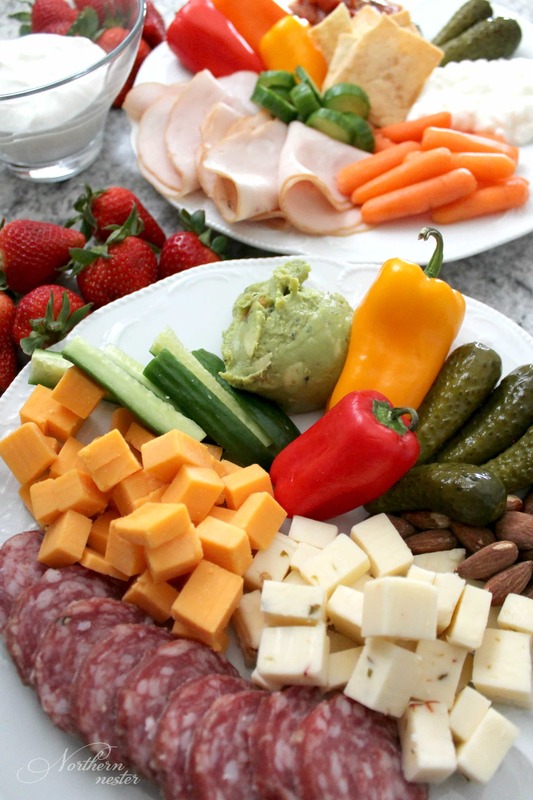 Finger foods satisfy my crave to snack. It’s like I can trick my brain into thinking I”m snacking all day, but just having a good, healthy lunch. Thanks for the ideas and the permission to have a platter lunch. I’m also a homeschool mom of 10 (“only” 5 at home this fall, tho) and totally get the coffee for lunch. What could i sub for the cottage cheese??? Thank you for posting. Very helpful! I don’t like cold sandwich meat like the chicken breast listed, anything else i could use and still keep an E?